Attila writes in with a how-to on isolating solate amniotic stem cells from a placenta, at home – this should generate a lot of conversations… check it out, the complete steps and discuss! The rest of the image(s) and information after the jump….Link to full sized image – here. 1. Googlise human amniotic stem cells and the potential of stem cell therapy. It is not fact but a promising possibility. 7. 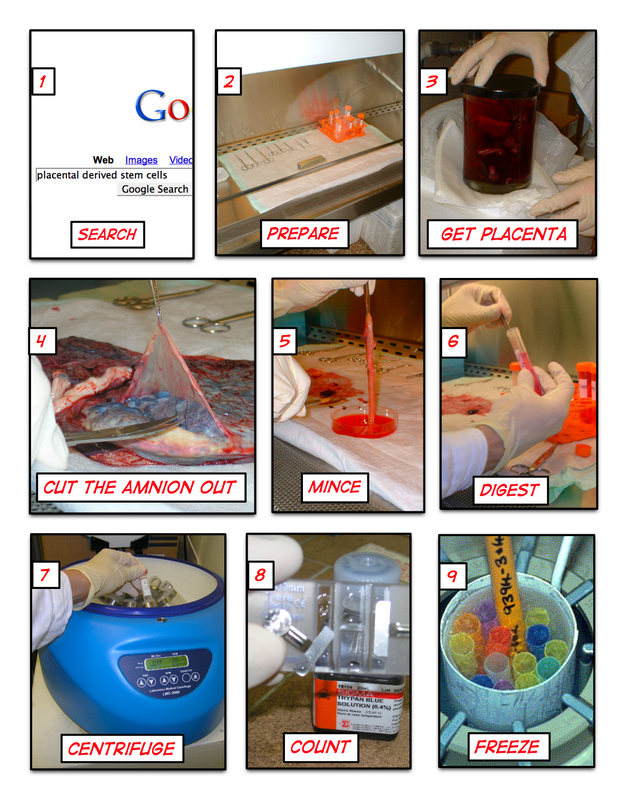 Put the flask with the placenta under the sterile hood. Take a sterile scissor and carefully cut the outside epithelial layer off. The more you cut, the more stem cells you get. The amnion layer is mechanically peeled off the chorion. 9. Mince the tissue thoroughly with sterile scissor. 10. To release amniotic epithelial cells, incubate the minced amnion membrane with trypsin (0.05%) for 10 minutes at 37Â°C. Take out the digested tissue from trypsin after 10 minutes, and discard the cells from this digestion to exclude debris. There are different kinds of trypsinization protocol, I follow here Miki et al. 11. Treat the remaining tissue in another tube of trypsin (0,05%) for 20 minutes at 37 Â°C (do this step once more if necessary to collect more cells). 12. Pool the cells from second (and third 20 minutes) digests. 13. Pass cell suspension through a 100 Î¼m cell strainer. 17. Prepare freezing medium. The freezing protocol is from the best lab manual, At the Bench: A Laboratory Navigator by Kathy Barker: 1ml/aliquot plus 10%. Freezing medium typically contain regular culture media, 10-20% serum, and 5-10% glycerol or DMSO. 18. Each ampoule will take 1Ã—10(7) cells (or between 4Ã—10(6) and 2Ã—10(7) cells) in 1ml of medium. 20. In order to freeze the cells gradually and safe place the ampoules in -60Â°C or less and leave them there for 16-24 hours. 22. Give the freezed cells to doctors, when it is needed for repair after X years.